Gigabyte P34G is a gaming laptop with the latest processor from Intel. Gigabyte is a company popular in graphics card, motherboard and such. So, the laptop from them is of course equipped with the best interior components from them. Though this laptop is 14 inch which is kind of small compared to the other gaming laptops out there, you can enjoy your gaming experience with the amazing performance that it provides. Let us take a look at the features and the technical specifications of the laptop. The Gigabyte P34G possesses the following technical specifications. This laptop is powered with the latest i7 processor from Intel clocked at 2.4 GHz to 3.4 GHz. It is a 4th generation chip with the power of running the latest games in the market. Almost all the games can be run on this laptop with at least the medium graphics settings. The latest processor gives you the advantage of running several applications simultaneously (multitasking) efficiently. This laptop comes with the Windows 8.1 operating system from Microsoft. It is surprising that there is no Windows 10 pre-installed in it. But you can anytime head on to Micrcosoft's official website and upgrade the to latest OS right away. The system comes with 4 or 8 GB of DDRIII L 1600 RAM which is great. But for even better performance you can upgrade the RAM up to 16 GB with 2 slots available for it. This can be enough to load most of the heavy software in the memory and work with it. Large amount RAM also contributes in helping in multitasking. The laptop comes with a 14 inch LCD screen with full HD screen resolution. The graphics card that comes with the laptop is NVIDIA GeForce GTX 760M GDDR5 with a video memory of 2GB. It also supports NVIDIA Optimus Technology. NVIDIA is the leading company when talking about graphics so it will make sure that every game will run on your laptop. As far as storage is concerned you can choose from two different models. You can get hard disks ranging from 500 GB to 1 TB to store all your data in it. You can also choose to get an SSD with up to 256 GB along with the normal hard disk. SSDs have a pretty faster transfer rate which you can use to boot up your OS or software and games. You can use the other hard disk to store your data and all your installed software and OS can be on the SSD. This can make things extremely fast for you. You get 2 USB(3.0), 2 USB(2.0), D-sub, HDMI port, RJ45 for internet using LAN, Headphone-out jack (Audio-in Combo), DC-in Jack and an SD Card Reader to read data from your digital camera directly. Along with that there is Wireless LAN: 802.11b/g/n and Bluetooth v4 for faster Bluetooth transfer. It also has a webcam of 1.3 megapixels which can be used for video conferencing. This laptop is equipped with a keyboard that can sense the surrounding conditions and change the backlit of the keyboard accordingly which will enhance your gaming experience in any situation. Now we'll take a look at the pros and cons of this gaming laptop. It is comparatively thinner and lighter compared to most other gaming laptops. 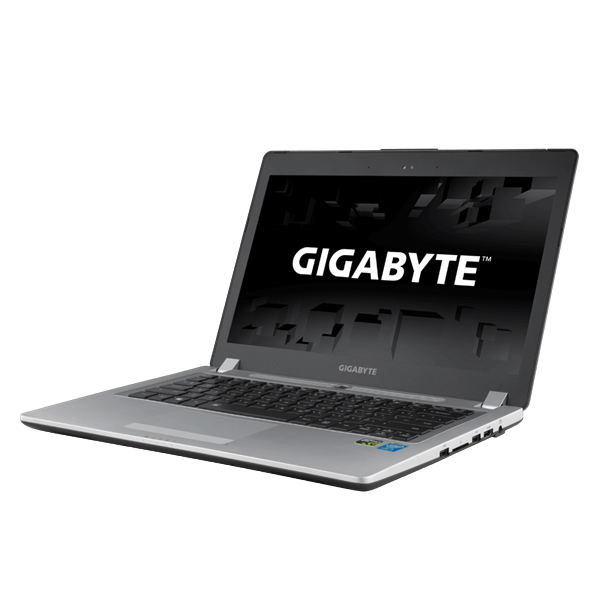 In my opinion Gigabyte P34G laptop is great if your are planning to get started with gaming. The latest i7 processor from Intel and the expandable RAM makes it stand out from the normal laptops. You can visit the official website of Gigabyte and check out the pricing for the model that you want.